I was trying to sort out a tricky plot problem with a story. It was the usual one – finding an ending that worked. I find the way to deal with a problem like this is to go for a walk. I was ambling along by the shops when the answer came to me, in a rush. ‘It’s the Golden Fleece, isn’t it?’ I muttered. I tend to say things like that out loud, which can be a worry. At my school we used to read the Greek myths. Stories of the ecstatic frenzy of the maenads, the one eyed Cyclops, or Medusa with the snaky hairdo tend to stick in the mind of a nine year old boy. The story of the Golden Fleece is that Jason was tricked into setting out on a quest by the king, Pelias. Jason, a ‘tall, long haired youth, dressed in a close fitting leather tunic and a leopard skin,’ lived in Thessaly, in central Greece. He was handy with his broad bladed spears and had a claim to Pelias’s throne. So King Pelias had a cunning plan for getting him out of the way. He promised to step aside if Jason would ‘free our beloved country from a curse.‘ It seems the king was being haunted by the spirit of Phrixus, who travelled about on the back of a sacred ram. To break the curse, Jason had to ferry the ghost of Phrixus back from Colchis, the country we now know as Georgia, along with the fleece of the ram on which the ghost used to ride. The fleece hung from a tree in the grove of Ares, and it was guarded day and night by a dragon. A tricky journey – across the Aegean, turn right at the Sea of Marmara, right again at the Black Sea and keep going. So Jason gathered comrades to accompany him on the Argo, the boat he’d had built for the voyage. Jason and his Argonauts set off to fetch the ghost and bring home the fleece. Jason finally reached the dragon’s grove. He was accompanied by Medea, the wife he’d acquired along the way. 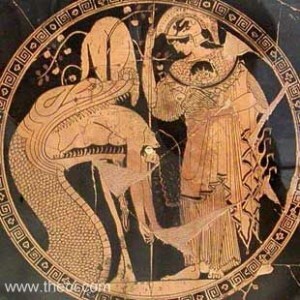 Medea soothed the dragon with incantations and sprinkled a potion on the creatures eyelids. So Jason grabbed the fleece and set off back to Thessaly. Even the road home was a nightmare. Jason lost many of his Argonauts. When he got back to Greece he discovered that the king had killed his parents, and to top it all Medea ran away with Zeus. Jason died alone, homeless and despised. Even his death was a tragi-comedy. He was about to hang himself from the prow of the Argo when it toppled over and killed him. But he had succeeded. He brought home the treasure – the Golden Fleece. This idea of the quest fits many film stories. The Fleece, the hero/ine’s goal, takes many forms. It might be love, or justice, or self knowledge. It might be the return of someone valuable. Think of The Searchers, with John Wayne as Ethan Edwards searching for Natalie Wood as Debbie Edwards, who had been taken by native Americans as a child. Or Paddy Considine as Richard in Dead Man’s Shoes, seeking vengeance on the men who tortured his brother. So the Golden Fleece might be revenge, or acceptance, or peace of mind, as well as treasure . It can be anything your central character desires, or aims to get. Though this ending, the return with the Golden Fleece, fits many stories, it is particularly apt in screenwriting. Aristotle said ‘write with the ending in mind,’ and that works for film scripts, where we write backwards. In film we’re are always writing towards the end. Everything is geared towards the climax at the end of Act Three. The ending is crucial. It has a physical effect on the audience. A good, satisfying payoff gives the audience a rush of the oxytocin, sometimes called the ‘love hormone,’ after the cortisol they’ve been wallowing in during the rest of the story.